Husky Liner Cargo and Trunk Liners are custom fitting floor mats with a raised lip designed to fit the complex contours of your specific vehicles carpeted floor areas. These "custom fit" liners are designed to fit your trunk and cargo spaces… like a glove. We make our custom fit liners with a patented rubberized thermo-plastic material that we guarantee not to crack or break. The Husky Liners Cargo and Trunk Liners form-fit design and raised embossing keep spills on the floor liner and your cargo out of the mess. 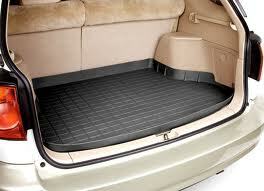 Our custom fit floor mat style Cargo Liners will keep your carpet looking brand new for the life of your vehicle. Not just guaranteed for 3 years… guaranteed for life. Available in Black, Grey and Tan. Husky Liners are made to fit most SUV’s, trucks and popular makes of cars.